Unhappy families gathered outside of Absolut Care of Aurora Park to protest family members not receiving proper care Saturday. 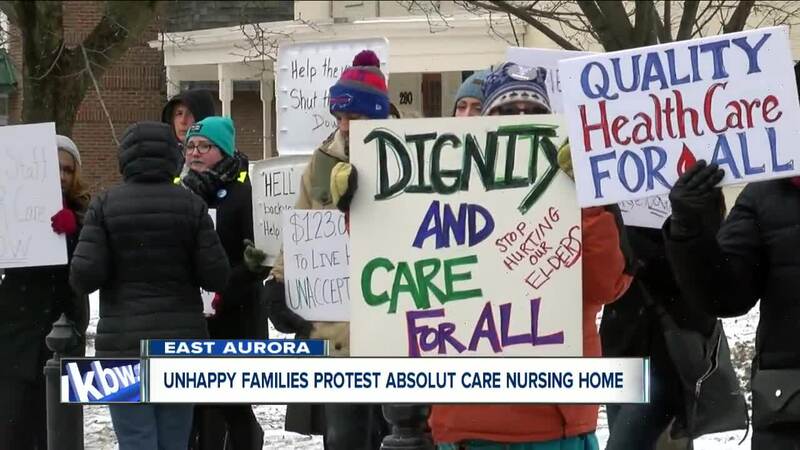 EAST AURORA, N.Y. (WKBW) — Dozens gathered in front of Absolut Care of Aurora Park Saturday where several people claim their family members were not properly cared for and are now demanding change. Protesters say there are far more patients than there are workers and they'll often find family members who go without aid for hours on end. "This cannot continue these people are spending hundreds of thousands of dollars to live in squalor and it's wrong," said Jennifer Page who is the daughter of a past resident. We continue to make strides in improving the resident experience at Absolut Care of Aurora Park by investing in our workforce and in the campus itself. We have partnered with the SEIU 1199 Worker Participation Fund with the goal of raising the quality of care, treatment and services we offer through our employees. These investments have already benefited our residents as reflected in the published CMS Stars rating; while the data that CMS uses is well over a year old, we are very confident that based on our current data submissions our CMS Stars rating will continue to rise. More importantly, the increased amount of positive feedback received from our residents and their loved ones continues to further support that Absolut Care of Aurora Park, while not currently rated as a five on the CMS Stars ratings, listens to our residents and their families. We fully believe that this collaboration is certainly working towards providing our residents a Five Star experience. It is our expectation that, all families have a positive experience with us and we regret to hear when any families are not fully satisfied with the care, treatment or services rendered to a resident at our facility. Because Absolut at Aurora Park is dedicated to protecting the confidential and private health information of our current and former residents we are unable to specifically comment on the experience described by the Clark family. However, we take the complaints made by the Clark family seriously. You can reference the Buffalo News Story published on Friday, February 8th to see that the New York State Department Health found the allegations unfounded. While we believe the vast majority of our residents and families are happy with the care they receive, we also recognize there is always room for improvement. This is why we work closely with families to discuss their concerns and reasonably resolve them. We remain focused on the ultimate goal of providing the highest quality care, treatment and services possible to the residents of Aurora Park.